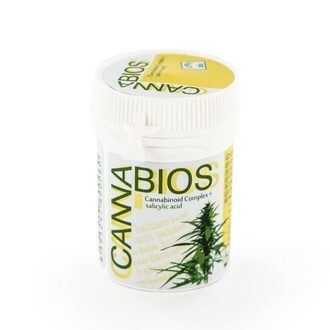 Cannabios' CBD Hemp Bio Balm with Salicylic Acid is made exclusively from natural ingredients. The combination of essential rosemary oil and salicylic acid gives this balm moisturizing power and helps in softening and soothing immalleable and calloused skin, making it particularly suitable for the treatment of dry skin. 50ml. Using all-natural ingredients and high-quality organic hemp, Cannabios has compiled an organic hemp balm. The additional combination of essential rosemary oil and salicylic acid gives this balm a more moisturizing power, making it particularly suitable for the treatment of dry, immalleable and calloused skin - it both nourishes and soothes the skin. Organic Hemp Balm with salicylic acid is made exclusively from natural ingredients. No artificial fragrances or chemicals have been added, making this balm ideally suited for people with a sensitive skin. No animal testing was involved in developing this product. Cannabis sativa extract: Organically grown here in Europe. Cannabios used this THC-free hemp extract as one of the most important ingredients in this skin care balm, for it is full of cannabinoids, particularly CBD. Hemp seed oil: The seeds of the hemp plant are pressed to produce this rich and nourishing oil. It is full of essential fatty acids, all of which nourish and moisturize the skin - keeping it young and fresh. Salicylic acid: This natural acid is particularly effective in helping to moisturize and soften hardened and calloused skin. It also increases the growth of skin cells and helps to reduce the severity of acne and other irritations. Rosemary oil: Rosemary oil gives the balm soothing, antimicrobial and antiseptic properties. Used regularly, it helps to protect and moisturize the skin. Olive oil: Olive oil is a particularly rich oil full of essential fatty acids, all of which are important for a healthy skin. With its high antioxidant content, it also helps to protect against cell deterioration and signs of aging.